In August 1907, while Iran was in the throes of its Constitutional Revolution, Britain and Russia concluded a secret agreement to divide the country between themselves into zones of influence. In 1910 with the tacit support of the British, Tsarist Russia occupied northwest Iran and violently suppressed the constitutional movement in Tabriz, the northwestern city which was at the center of the constitutional movement. The ferocity of the Russian occupation took the leaders of the constitutionalists by surprise, and in desperation they cried out for help to democratic nations. Edward G. Browne was a scholar and professor at Cambridge University who wrote The Persian Revolution and the four-volume Literary History of Persia. He supported the constitutionalists in word and deed. Appalled by the British government’s acquiescence of the Russian atrocities in Tabriz, he tried through letters to the editor, political lobbying, and the writing of pamphlets to mobilize public opinion to force the British government to intervene with Russia. 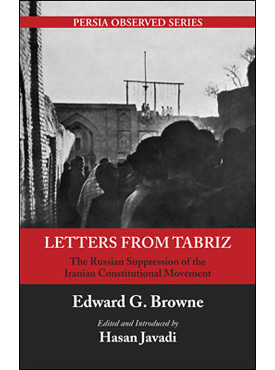 Letters from Tabriz is the publication, prepared by Browne, of the letters sent to him by Iranian constitutionalist leaders describing, in rousing eyewitness accounts, the Russian atrocities in Tabriz. Its full publication was stifled because of the Anglo-Russian partnership prior to World War I, and it has never been published in English until now.